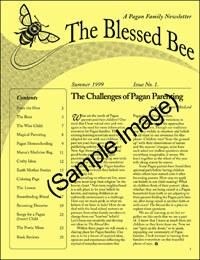 The Blessed Bee - Year Two (#5-8) [bb-2] - $11.95 : BBI Media - Magazines that feed your soul. The Blessed Bee #5 Starting a Family Tradition · The Wise Child: Summer Honey · Magical Parenting: Magic, Bad Grade, & Kids · Pagan Homeschooling: Busy, Bountiful Summer · Mama’s Herbal Medicine: Eating the Flowers of Summer · Crafty Ideas: Make a Faery Aquarium · Pagan Family Values: Crafts For Long Summer Days · Earth Mother Stories: Isis, Osiris, & Horus · Songs for the Inner Child: The Virtues of Summer · Song Circle: Circle Round · Do You Believe in Faeries? · Return of the Moon · A Wiccan Birthday Ritual · Bella Luna Moon Tree! · Walking in Spirit · Goddess Medicine ·30 illustrated pages. Edited by Lauren Foster MacLeod. Published in Summer 2000. The Blessed Bee #6 The Changing Seasons of Pagan Parenting · The Wise Child: Leaf Learning · Magical Parenting: Kids & Autumn · Pagan Homeschooling: Have a Fairy Party · Mama’s Herbal Medicine Bag: Healing With Yellow Root · Pagan Family Values: Sharing Nature’s Harvest · Earth Mother Stories: Kali, the Black Goddess of India · Songs for the Inner Child: Mysteries of the Equinox · Song Circle: Place of Power · Crafty Ideas: A Wreath For All Seasons · Place of Power Meditation · How Becoming a Mother Has Brought Me Closer to the Goddess · Beer in Fridge; Breast Milk in Freezer · A Womb Loss Ceremony · Goddess Visions: A Birth Story · 30 illustrated pages. Edited by Lauren Foster MacLeod. Published in Autumn 2000. The Blessed Bee #7 Timber Lines: Adapting Old Customs for New Times · The Wise Child: Enshrining Your Family’s Year · Magical Parenting: Grand Experiments · Pagan Homeschooling: Balancing Winter Activities · Mama’s Herbal Medicine Bag: Helps For the Hospital · Pagan Family Values: Heart-Warming Winter Ideas · Earth Mother Stories: Kwan Yin, the Compassionate Mother · Songs for the Inner Child: Yuletide Carols · Song Circle: Holy Water, Sacred Flame · Crafty Ideas: Wonderful Winter Crafts · Protecting Our Children · The Healing Use of Ear Candling · A Ceremony For Weaning · The Give-Away 30 illustrated pages. Edited by Lauren Foster MacLeod. Published in Winter 2001. The Blessed Bee #8 Perennial Awakenings · The Wise Child: Nests & Wings · Magical Parenting: Guilty Pleasures · Pagan Homeschooling: Homeschooling Support Systems · Pagan Family Values: Celebrating Spring’s Return · Earth Mother Stories: Oshun, the River of Life · Songs for the Inner Child: Songs for Blooming · Song Circle: The Rain Song · Crafty Ideas: Beltane Celebration Ideas · A Children’s Herbal: Dandelion · Magickal Spring Cleaning · A Fairy Grandmother Blessing · Pagan Festival Community · On Being a Teen Witch · Three Mothers Review Pagan Parenting · 30 illustrated pages. Edited by Lauren Foster MacLeod. Published in Spring 2001.